The prints of Jacob Lawrence displayed in the new exhibition History, Labor, Life, offer compelling imagery of historical struggles for freedom as well as snapshots of everyday life for blue-collar Americans. For this new film series, we take inspiration from the artist and present four films that bring into focus the issues faced by working-class people seeking to live the American dream. Click HERE for a Member Series Pass. 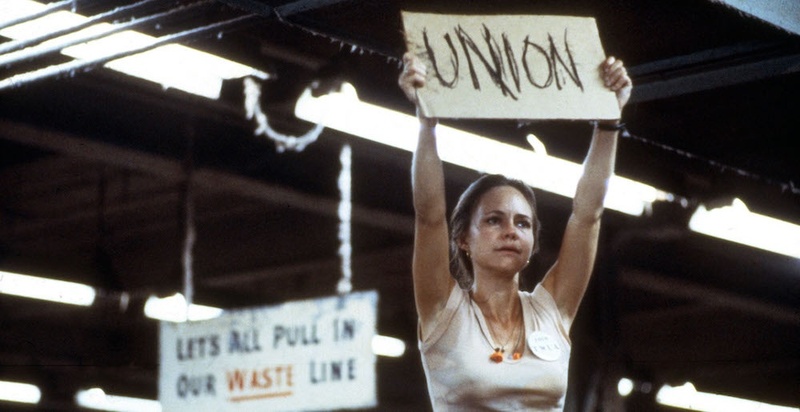 Starring Sally Field in her Oscar-winning performance, Norma Rae tells the real-life story of Crystal Lee Sutton, a textile factory worker in North Carolina who fights to unionize her fellow workers due to their poor working conditions. Field’s performance electrified audiences, and the film remains one of the most iconic depictions of blue-collar struggles and triumphs. A Better Life stars Demián Bichir (Che and TV’s The Bridge), who earned an Oscar nomination for his performance, and follows the story of single father and undocumented immigrant gardener Carlos whose son is navigating high school and the perils of Los Angeles gang life. When Carlos’ work truck is stolen, the father and son try to find it together, but Carlos faces constant risk of arrest and deportation. With understated and compelling performances called “touching and startling” by The New York Times, the film tells the universal story of what a parent will sacrifice for their children and family. Written and directed by John Sayles (Lone Star), Matewan tells the true story of a 1920s coal miners’ strike that turned violent in the West Virginia town of Matewan. Starring Chris Cooper in his film debut and James Earl Jones – whose performance “practically glows in the dark” (Variety) – Matewan offers stirring storytelling with themes that are as relevant today as they were 100 years ago. The classic film adaptation of John Steinbeck’s landmark and Pulitzer Prize-winning novel, The Grapes of Wrath stars a young Henry Fonda and was awarded the Oscar for John Ford’s brilliant directing. The story centers on the Joad family who, like so many families devastated by the 1930s Dust Bowl, are forced to abandon their Oklahoma farm and head West. Full of tragedy and hope, The Grapes of Wrath boasts iconic performances and imagery that must be seen on the big screen.